THIS GOLF IS ALL SERIOUS WORK! Some other players are more advanced. In the spirit of U3A, we all help and learn from each other. Experienced players may accompany the more inexperienced and pass on their golf techniques and skills. We try not to take ourselves too seriously. Our aim is to improve our playing and enjoy the fresh air and company of others. After playing, we meet in the Manor Hotel and have lunch and a chat! It is that time of year where some activities are put on hold/postponed for a while. For a few months the weekly golf group meetings will stop. However, if you want a game of golf and the conditions are favourable, just ring Paul. 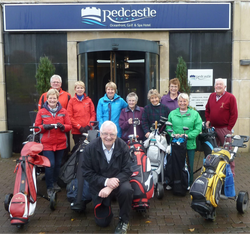 ​Congratulations to Facilitator Paul McCusker and all who took part in the Golf Trip to The Redcastle Oceanfront Hotel at Inishowen. Rumour has it that a fabulous time was had by all, and there are plans for a Springtime trip!